The SG 10.0-193 direct-drive turbine features a 193-metre rotor diameter — using 94-metre blades — and a larger generator diameter, the company announced. "The new SG 10.0-193 DD combines experiences and knowledge from five generations of proven direct-drive technology in one 10MW turbine," said Markus Tacke, the company's CEO. 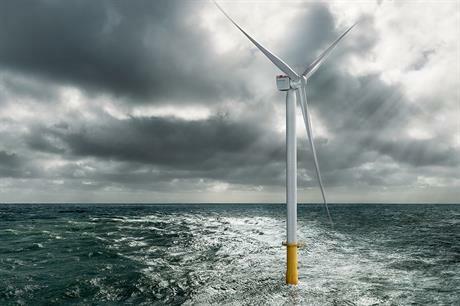 The leading offshore wind turbine manufacturer said the product is due to be available from 2022, following the installation of a prototype later this year. SGRE said the turbine is expected to produce 30% more power annually than its 8MW predecessor with a 167-metre rotor. "The levelised cost of energy from offshore wind continues to decrease as industry scale and performance grow. "New markets are developing across the globe, all of which require cost-efficient, reliable and clean power for generations," Andreas Nauen, SGRE offshore CEO, added. SGRE is the latest of all the major offshore wind turbine OEMs to expand product portfolios with a 10MW+ model. Just under a year ago, GE Renewable Energy threw down a gauntlet, announcing its next model would be a 12MW turbine with a 220-metre rotor using 107-metre blades. Initial shipping is expected from 2021. This was followed in September by MHI Vestas up-rating of its V164 workhorse model to 10MW, from a previously rated 9.5MW, becoming the first 10MW+ turbine available on the market. German OEM Senvion is also known to be working on a 10MW+ model as part of a European Union-backed collaboration research project. Chinese firm Goldwind, the only other major offshore wind turbine manufacturer, recently unveiled plans for an 8MW model, but a 10MW+ model is surely not far off. Prior to its merger with Gamesa in 2017, Siemens teased development of a 10MW+ model as early as June 2016. SGRE's then-offshore wind chief Michael Hannibal said at the time: "Going towards 2025 there will be a new platform introduced. And as history has told, it will get bigger," suggesting the new platform would be 10MW or larger. "What we need to see now is a period where we can do evolutions on the [6-8MW turbine] until the 2020s to get this one really efficient," he added. Since then, and following the merger, SGRE launched its 8MW turbine with an extended 167-metre rotor in November 2017, which has already built a sizeable order book in Denmark, France, Taiwan, Belgium, and the UK. Earlier this month, the SG 8.0-167 model was ranked as the best offshore wind turbine in Windpower Monthly's annual technology awards. Its development can be traced back through several generations to the company's 6MW turbine with a 154-metre rotor, launched in 2011.